Stands-In-Shallows is an Argonian rogue who works on the docks of Windhelm. He lives in the Argonian Assemblage with the rest of the local Argonian population. He has an addiction to skooma that he is struggling to cope with. Stands-In-Shallows begins his day at 9am by heading out to the docks to work. He will continue to work at the docks until 8pm, at which time he will head back inside the assemblage. Now inside again, he will stand roughly in the center of the room for the next four hours. Once midnight strikes, he will head to bed to prepare for the next day. Stands-In-Shallows wears a set of ragged robes, without even a set of shoes. He carries an iron dagger to defend himself. Besides that, he carries a key to the Argonian Assemblage and a selection of lower-class items and gold. Encountering Stands-In-Shallows while he is at work may have him mutter: "Another day, another septim." He will also make mention of the willingness for his fellow Argonians to work in their oppressive occupations: "The young folks are too happy to break their backs for the Nords. They forget what it was like to swim free." Should he be encountered between the hours of 8pm and 7am, he will also confusedly say: "Huh? What's that now? Leave me alone." When ending a conversation with him, his ending remark depends on whether you are an Argonian or not. 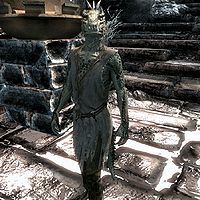 If you are not an Argonian, he will say: "I would not complain if you returned with some Skooma. " Argonians will instead hear: "Trust me, marsh-friend, you do not want to live in this city." If you do not have any other instance of Some Light Theft active, Stands-In-Shallows will greet you by complaining about his skooma cravings: "By the Hist, if I don't get something soon, I don't know how I'll get through the week." Asking him if he is alright will have him request that you steal some special skooma for him: "No. I'm not. I feel like my scales are clawing into me. Maybe you could help an old Argonian out? I heard some of the sailors talking about how they stashed a bottle of Double-Distilled Skooma in the Gnisis Cornerclub. I just need a taste." Agreeing to do this favor will have him respond: "Thank you. I'll be waiting for that bottle." If you reject the quest he will instead say: "Hist spit on you." Returning with the skooma will have him thank you and provide an instantaneous level in the Sneak skill: "Thank you so much. Here. Let me show you a thing or two about not attracting attention to yourself." Stands-In-Shallows stands around in the Argonian Assemblage between 8pm and midnight. This is due to an AI package called "StandsInShallowsDoesSkooma20x4". While this package suggests he would use skooma during this time, the package does not allow for any such action. This page was last modified on 20 February 2017, at 09:07.